When several fishermen set out of their coastal city or Miri, Malaysia, they were hoping to snag the big one. But they never expected that the big one would be a 10-foot male saltwater crocodile that got caught in their line. Most people would have run for the hills when faced with such an enormous predator. They would have cut the line and carried on fishing, thanking their lucky stars that they didn't end up as the croc's lunch. But not these fishermen. Instead of letting it go, they let him have it, and the resulting video of what happened next is absolutely disgusting. After dragging the exhausted crocodile back to shore, several of the men hopped out of their boat to inspect it. One of the men approaches the reptile, which is just lying calmly in the sand, and then thwacks it over the head with a metal hammer. Once hit, the croc tosses and turns, spinning in the sand and writhes in pain. The man continues to beat the animal until it dies. There was no reason for these men to murder the crocodile. They could have simply cut it from the net and let it swim back into the water to live another day. But for some reason, they decided that killing it was a better idea. 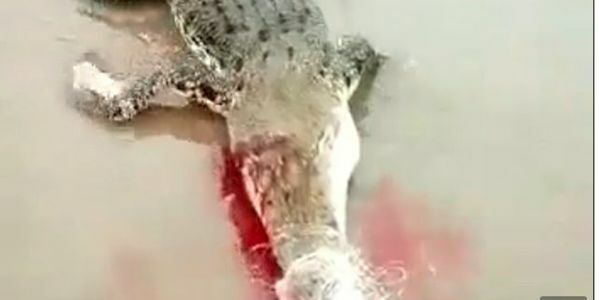 While saltwater crocs are not a protected species in Malaysia and killing them is allowed, doing so in this way is against animal cruelty laws and the men in the video should be found, arrested and charged accordingly. Please help end animal cruelty anywhere it happens. Sign the petition and tell Malaysian authorities that these men should be caught and brought to justice.